Wednesday, November 12, 2014, 8:03 AM PST, the European Space Agency's (ESA) Rosetta spacecraft successfully launched the landing probe, Philae, to a landing on the surface of comet 67P/Churyumov-Gerasimenko, a historic first. Cheers, Rosetta and Philae! On Thursday, the Rosetta spacecraft, in orbit around the comet, relayed from Philae the first-ever image from the surface of a comet—an extreme close-up of ancient terrain that goes back four and a half billion years, to the earliest times in our solar system. That picture, to me, is worth the entire 20 year effort to deliver Philae to the spot it now rests—and a wealth of data from other instruments on Philae is yet to come. This was a moment more than 20 years in the making; the last ten years were spent just traveling to the comet. Exactly where the lander sits is not presently known. There were unexpected challenges during the landing operation, starting before Philae was even launched from its mothership, Rosetta, when it was discovered that a thruster on top the lander had failed. The thruster's function was to help prevent the probe from bouncing off the comet's surface upon landing. In the low gravity environment of the comet, a bounce speed of only three feet per second could send it floating back into space. ESA operators decided to proceed with the landing despite the lost thruster, relying on other systems designed to make the lander stick to the comet: a harpoon anchor, shock absorbers and fastening augers in its landing gear. Shortly after midnight on Wednesday, Philae separated from Rosetta and spent the next seven hours coasting at about two miles per hour to its target landing spot on the comet, landing site J. All that ESA operators could do was watch telemetry come in and wait, hoping for a textbook landing—although, this being a first-ever event, it's not in any textbooks, yet. At 8:03 AM PST, ESA received confirmation that Philae had landed on schedule, setting off a cathartic explosion of cheers around the ESOC control room in Darmstadt, Germany. Ground images from Philae did not come in immediately, for the Rosetta spacecraft, Philae's relay station with Earth, soon set below the horizon of the comet, and would not emerge for another twelve hours. When communication was reestablished, and data from Philae's ROMAP instrument was analyzed, it was learned that the probe had experienced not one, but three distinct landings. The first landing reported by the data coincided with the initial landing confirmation. Then, almost two hours later, a second landing event was indicated. The harpoon system, designed to fire an anchor into the comet to tether Philae down, had not functioned, and Philae had bounced. Seven minutes after the second landing, a third was reported by the data, the lander apparently having bounced a second time. This time, however, it appeared that Philae had come to rest somewhere on the surface. ESA scientists are attempting to triangulate its exact position with instruments on Philae and Rosetta. When the first pictures came in they showed what looks like a jagged, dusty, even gravely cliff face, and no framing horizon. Philae was not level with the ground, but resting at a tilted angle. Later, additional images sent back were assembled into the first panoramic view from the comet. Despite the excursions from a perfect landing scenario, Philae has landed, and we are there, thanks to the telepresence the washing-machine-sized robot has given us. This was a moment more than 20 years in the making; the last ten years were spent just traveling to the comet. And though a great deal of careful design, planning, and testing took place to help ensure success, in remote space exploration there is always the specter of a critical failure that can make the entire expedition come to naught--particularly with robotic spacecraft operating hundreds of millions of miles from Earth. 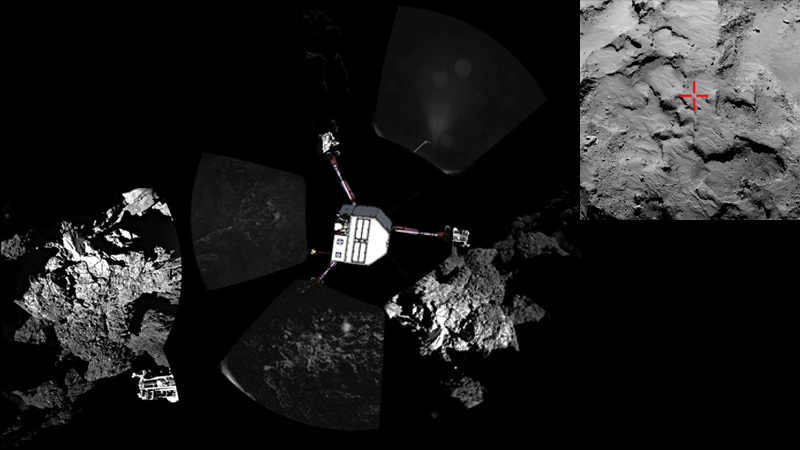 This is still an adventure in progress, and Philae may not be completely out of the woods just yet. Its tilted landing orientation could mean that it is perched on the edge of a cliff, or in a pit. It may also present problems when the lander's initial 60-hour battery life runs out and it needs to switch to its solar-charged battery system. If the tilt of Philae's solar panels does not provide adequate energy, it could run out of power sooner than planned. In any case, both Philae and the orbiter Rosetta are bound to the comet's sun-approaching trajectory, which will carry them to a closest point to the sun next August. As the drama of Philae's uncertain life ahead unfolds, so will that of the comet as it heats up and becomes more active--and we have a front row seat.